On March 1st, I helped to organized and facilitate a Larry Bell Urban Forum on the smart city in downtown Vancouver. The video recordings from this two-part event are now available, discussing opportunities for tangency as well as the persistent disconnects in our thinking regarding the implementation of digital technologies in our cities. I've copied the transcript of my opening comments, below. Across our planet, city managers are turning toward sensors and algorithmic technologies to mitigate and curtail social and environmental risk, to produce efficiencies, security, and economic potential in the everyday. In just a month, the City of Vancouver and the City of Surrey will join the Canada Smart Cities Challenge, a competition for up to $50 million to use “data and connected technology [to produce] meaningful outcomes for residents”. In this Larry Bell Urban Forum, we have an opportunity to discuss this competition and general calls for urban innovation, understanding that what each of us think in terms of meaningfulness might, productively, differ. The participants on the panel tonight represent a range of interests, more immediate intervening efforts and long-term strategizing and thinking. Some will have specific knowledge of efforts underway in Vancouver and Surrey, while others will have more general perspectives to offer. My overarching logic of this gathering is to help provide an address to general questions, “what kind of smart city? 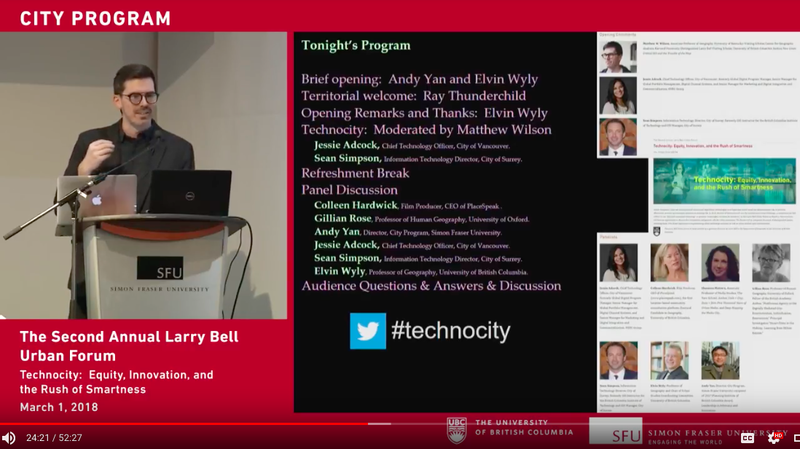 Smart city, for whom?”, and with specific thought to the uniqueness of Vancouver’s and Surrey’s positions in this more recent opportunity for investment in urban technology. As such, tonight is organized into two parts: we’ll first hear from Jessie Adcock and Sean Simpson, with the cities of Vancouver and Surrey, respectively, followed by a wider, facilitated conversation with our distinguished panel, partially responding to the challenges and opportunities of the Canada Smart City competition, to think more generally about the rush of smartness, with you, our audience. In my most recent book, New Lines: Critical GIS and the Trouble of the Map, I explore what I consider the various troubles of the map, both the specific problems that maps are called upon to address and the problems that maps directly or indirectly enable. Trouble is risky and rewarding. It is both pain and pleasure. Here, I attempt to follow Donna Haraway, not to resolve trouble, but to stay with it, to wallow in all the messes that trouble makes. The ‘smart city’ and the rush of smartness are such troubles, I might suggest. In some sense, their logics are already here and now, and our challenge is how to make this renewed mandate for smartness more responsive and more responsible. It is this last conceptualization of technicity, from Stiegler -- as an originary condition for human life -- that is most ponderous for me. To experience space, such as the space of this room, or the space of the city in which this building is located and which locates us, is to fix time. Stiegler argues that technologies have long given humans a sense of the present, a relation to memories long past and an orientation to futures not yet arrived. Technologies grant us some capacity to act and some range of motion in which to actualize. Here, he is not limiting his philosophy to digital technologies, but to the multiple forms of apparatus that constitute our humanity. Of course, I am biased, but I would propose that geographers have long been interested in this kind of technicity, as that which conditions human life, whether that is an interest in human-environmental relations, or urban and economic, social and cultural, political and physical domains of inquiry. From my partial perspective, I consider the map, mapping, and mapmaking as having such technicity. Maps enable a kind of quandary. The lines we draw upon the map, in turn, draw us in. The neat lines on our mobile maps and the glowing blue orb that tells us, ‘you are here’, are not only informative. These markings are also suggestive -- prompting us in this or that way. I often think these kinds of moments of the map as a question of habit -- of consciousness itself and the action, inaction, practice, and thought that saturate these moments. Maps as objects with technicity enable habits, causing us to move, to be moved, to attend, to care. However, there are new lines, new maps, new objects of technicity in our midst. I tend to conceptualize them as ‘quantified self-city-nation’, as a general theory for the technoscientific solutions we offer to confront socio-technical problems. As a geographer at the intersection of critical social theory and geographic information science, I am interested in the technologies of geographic representation. More than GIS, I take up the conceptual drift of the map, as one such technology of representation, and I burden the map with the weight of some important socio-technical changes. I tend to think of the map as an artifact of the times and spaces of map-use, rather than a clarified vision of reality. Thought in this way, the map is already an externalization of human culture, memory, and action. The point is to thicken our understanding of these objects, to think of them as more than a tool, more than a static object. I would suggest, then that this shift in thinking, this thickening of objects with technicity, can be applied to a variety of technoscientific solutions to socio-technical problems. Following Stiegler, these digital technologies are our pharmaka, both our poison and our most urgent cure. These pharmaka reflect not only the reality we hope to understand and change, but also the techniques for thinking about life itself. As such, these are retentional techniques -- constituting both to what we pay attention and how we pay attention. Digital technologies have the ability to draw our eye, to condition about what we care, how we might be convicted, how we might act. Attention is care. And there is much to care about, and much that continues to distracts us! In my book, then, I construct the concept of ‘quantified self-city-nation’ in order to examine specific technologies of representation, to consider their technocultural conditions and ramifications. New devices and techniques have emerged to better quantify an individual’s movement, stasis, and even sleep. A discourse about the ‘smart city’ applies these principles of measurement and quantification to the analysis, representation, and management of the city. The rapid pace of everyday life alongside increased individual access to digital technologies in advanced capitalist societies has meant, for some, a broadened capacity to acknowledge, represent, and measure the movements and the habits of society. Perhaps a new quantitative revolution is upon us, as another of our panelists, Professor Elvin Wyly, has proposed, and along with it an evolved political economy that puts a premium on the digital dossiers of the masses, in service of an agenda of efficiency, advertising, and marketing. Cities are frequently invoked in these calculations, rethought as organisms while human bodies are quantified as systems. As such, the interactive opportunities and limitations for engagement, representation, and resistance are evermore significant. I frequently think the parallels between a rising consumer-electronic sector around personal activity monitors (fit bits, smart watches, etc.) and the rapid visioning and speculation around smart cities. To be clear, a totalizing rejection of the force of quantification is too hasty. In her discussion of radio-frequency identification (RFID), Louise Amoore highlights this pharmalogical moment: “The capacity of RFID to make us locatable is actually acutely ambivalent: we feel its potential to watch and to incarcerate just as we simultaneously feel it fulfil some of our desires and pleasures.” I read Stiegler as suggesting that this ambivalence, between incarcerating surveillance and voyeuristic pleasure, is productive. Only when the extremes of the dualities become toxic is another relation urgently necessary. I propose ‘quantified self-city-nation’ as a peculiar trouble that we must stay with. To invoke this as a concept, is to conceptualize how certain solutions are always in search of particular problems, and how this myopia -- an inability to think outside quantification -- introduces some curious technocultures. Quantified self-city-nation signals a system of attentional control across scales, where the organization of an individual body, its movement and stasis, becomes the resource for the organization of bodies, both human and more-than-human. In other words, quantification is not just about counting and calculation and systems of empiricism, but about leveraging a discourse of predeterminacy, preemption, and a tilting toward the future. Digital devices that map the movements of a self become metaphors and figures to upscale these techniques for neighborhoods, for cities, regions, and nations. As these technologies achieve greater ubiquity, their ability to have both greater resolution and personalization widens. With this comes a new register of problems that can be solved -- through greater measurements and adjustments of systems. And it is the way in which these techniques slip across scales that continues to pique my interest. How, and to what, might a body attend in the techno-city? How, and to what, might a city pay attention? How, and to what, might a nation care? What are the possibilities for intervention, refocus, or for changing the channel? What are the unique challenges of this techno-city, and all the dispossessions and speculations that mingle on the street, at the beach, on the waters, and in the nearby mountains? How might this rush of smartness, this techno-city, champion both greater equity and the creative forces of innovation?